Secretary of State Rex Tillerson speaks at the Center for Strategic and International Studies, Oct. 18, 2017, in Washington. After what U.S. officials said was several months of deliberation among President Donald Trump’s national security team, Secretary of State Rex Tillerson recently took a rather strident tone towards China in a major speech that came just weeks before Trump’s first state visit to China. The remarks, which also hit China’s continuing reclamation in the South China Sea, are seen as a reflection of U.S. impatience that Beijing is not ceasing its aggressive actions in the South China Sea, a crucial trade route for the world’s largest economies. “China’s provocative actions in the South China Sea directly challenge the international law and norms” that the United States stands for, added Tillerson. The top U.S. diplomat’s forceful remarks came as Trump is getting ready to embark on his first travel to Vietnam and the Philippines, two claimants of disputed areas of the South China Sea, attending summit meetings where leaders from Southeast Asia gather. 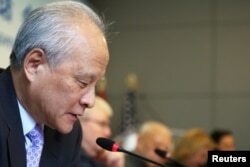 On Monday, Chinese Ambassador to the United States Cui Tiankai pushed back, saying Washington should not try to interfere in regional efforts to resolve disputes in the South China Sea. Ambassador of the People's Republic of China to the United States Cui Tiankai speaks during the "China and the U.S.: One Belt, One Road and 100-Day Plan," a discussion hosting high-level delegation of Chinese leaders, in Manhattan, June 14, 2017. For years, the United States has been calling for an expeditious conclusion of an effective and binding Code of Conduct between China and the Association of Southeast Asian Nations (ASEAN) in the South China Sea. China has angered four Southeast Asian states by expanding its coast guard and military presence in the South China Sea, a 3.5-million-square-kilometer tract of water rich in fisheries and fuel reserves. Claims by Brunei, Malaysia, Vietnam and the Philippines overlap that of China, which calls nearly the whole sea its own. While the United States is not a claimant to the sovereignty over disputed islands in the South China Sea, Washington said it is vital to its national interests that various claimants pursue their claims peacefully. With international attention focused on North Korea’s missile and nuclear threats, tensions in the South China Sea have slipped from the headline in recent months. Chinese structures are pictured on the disputed Spratlys island in South China Sea, April 21, 2017. Meanwhile, the Trump administration is preparing to fill positions that focus on Asia policy, as the U.S. president departs for East Asia. The Senate recently confirmed the appointment of Daniel Krintenbrink, a career diplomat, as U.S. ambassador to Vietnam. Another highly-anticipated nomination is Randall Schriver, a well-respected China hawk, who was tapped last week for the top Asia policy job at the Pentagon. Trump announced his intent to nominate Schriver as assistant secretary of defense for Asian and Pacific affairs. Schriver has advocated for a strong U.S.-Japan alliance and high-level engagement with Taiwan, which he said “serves the U.S. national interests and values.” Schriver also has argued the political and security environment in East and Southeast Asia has changed a great deal since 1979, the year that Washington broke diplomatic ties with Taipei and recognized Beijing. “Taiwan is a full-fledged democracy and willing security partner to the United States. China’s assertiveness threatens peace and stability in the Taiwan Strait and the South China Sea,” said Schriver. China claims democratically ruled Taiwan is part of its territory and has never renounced the use of military force to bring the island under Beijing’s control. In a letter to Trump on Oct. 26, co-chairs of the Congressional Taiwan Caucus voiced the importance of a value-based strategic partnership with Taiwan. “Taiwan is one of our closest allies in the region, and congressional support of Taiwan remains strong and bipartisan. Our two peoples share many of the same values, and a commitment to democracy and the rule of law,” said Republican Representative Mario Diaz-Balart, who serves in the House Committee on Appropriations along with fellow Republican Gregg Harper and Democrats Albio Sires and Gerry Connolly. 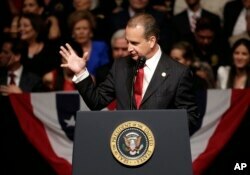 Congressman Mario Diaz-Balart speaks at an event where President Donald Trump announced a revised Cuba policy, June 16, 2017, in Miami. Former White House National Security Council Senior Director for Asia Affairs Daniel Krintenbrink was confirmed last Thursday as U.S. ambassador to Vietnam. Krintenbrink told Senate Committee on Foreign Relations in a nomination hearing that one of the U.S. policy priorities is to strengthen maritime security cooperation with Vietnam and to “resist coercion” in the disputed South China Sea. Wilder, who worked at the White House National Security Council for former President George W. Bush, said it was important to have Krintenbrink confirmed before Trump’s visit there. Mapping the U.S. strategy from the Indian Ocean to the Pacific Ocean, a senior State Department official recently laid out Washington’s vision to deepen security cooperation with three other democratic allies: Japan, Australia, and India. China, a non-democratic society, was not in U.S.’ strategic partnership in the Indo-Pacific region. In response, Chinese Ambassador Cui said on Monday, “I don't think any attempts to form exclusive clubs in the region” would help anybody.